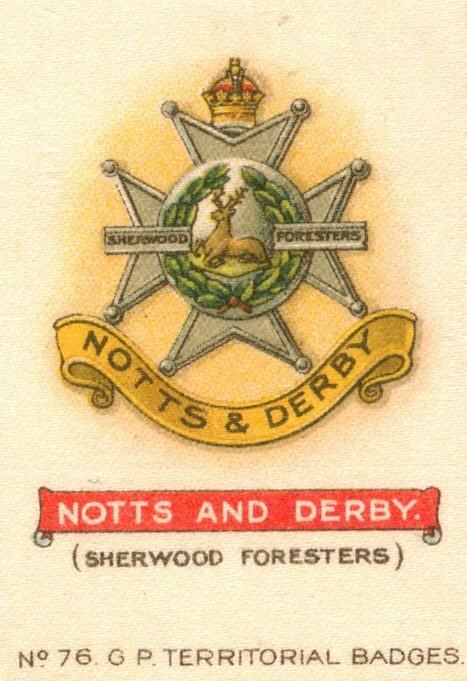 Through this site I would like to provide a history of the 6th (Derbyshire) Battalion, the Nottinghamshire and Derbyshire (Sherwood Foresters) Regiment, from its formation in April 1908 to the final days of WW1 and the storming of the Hindenburg Line in October 1918. 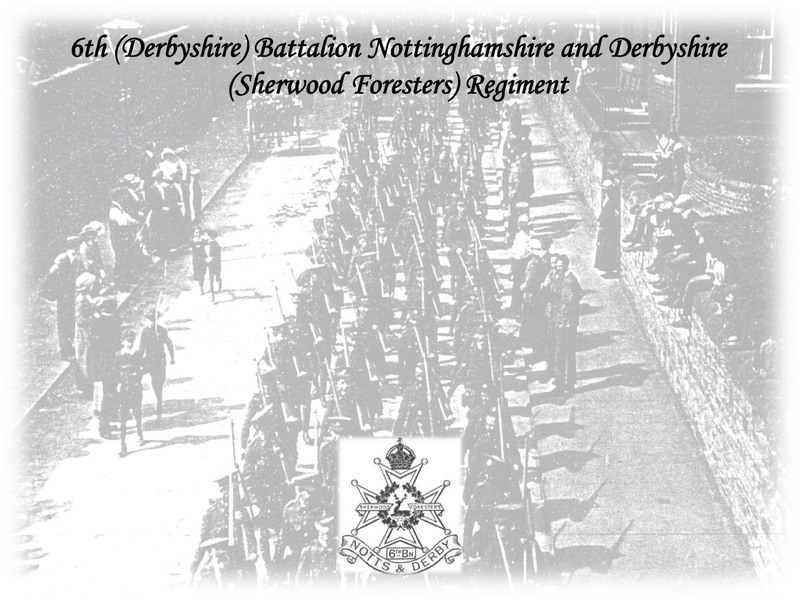 From having a long standing interesting in the 6th Battalion, due in part to being brought up in Chesterfield (like my father and grandfather before me) and after collecting numerous pictures, postcards and other documents over the years it was always my intention (and desire) to write and hopefully publish a “Pictorial History of the 6th (Derbyshire) Battalion, the Sherwood Foresters”. But let’s face it, work gets in the way of all fun things! So I’ve decided to go ahead and ‘publish’ on line. It was never my intention to profit from my interest; so here it is……………. I plan to do ‘my history’ through a series of “on this day…” posts by highlighting events that happened to men of the Battalion on any particular day of the war, be it 1914, 1915, 1916 etc. My focus will always be on the individual men and not necessarily on the fighting or the tactics of WW1, there are many people more expert than me for that. I have also created ‘themed pages‘ that I will populate over time with interesting photographs and information. Apologies up front if some of this gets too ‘anoraky’. Finally, over the years many people have sent me pictures and information and when I can remember I will be sure that I acknowledge appropriately. If you think that I have failed to so this then please contact me. The shopkeepers, coal miners and foundry men from Chesterfield, Staveley and Clay Cross. Limestone quarrymen and stone masons from Wirksworth, Chapel-en-le-Frith and Bakewell. Printers and dyers from Whaley Bridge, New Mills and Hadfield. Great work. I must say that I am as happy as a pig in muck on this site. As a local lad with a great interest in Chesterfield men during WW1 this site is right up my street. It’s already great to see a couple of men from the villages where I grew up too. I look forward to watching the site grow as more info is added. The photos/postcards are fantastic to look through. Many thanks Shane, glad you like it. I’m having great fun sorting through all the photos and adding them. Lots more to be uploaded. Hi This is, without doubt, a magnificent site. The information that has been collected is fantastic. I have been researching a soldier Private 1514 George Thompson from, Darley Dale, 1st/6th ‘E’ Company for the family and found a photograph with a paragraph from a letter to his family. They will be chuffed to bits to see and read. I have his Service Record and Medal card, is this something that you would appreciate? Richard, thanks and glad you like the site. I’m certainly having great fun finally being able to put all this content together. I have his service record but many thanks for the offer. I have uploaded a newspaper clipping of George (from High Peak news I think) and also a .pdf version of the full letter. A family member of George’s sent it to me >10 years ago. Cheers Mike. I can email better quality images and also picture of his grave. I know the family very well and I am sure they would find it most interesting to find out who sent you a copy of the letter. Can you help? Sorry, but Iv’e checked back and I now no longer have the e-mail correspondence. It must have been 10 years (and several PCs) ago and I only have records back to 2009. Mike. Thank you so much for all your on-going hard work with the Notts & Derby information & photos . Through this sit I’ve just found my grandad was A H Bennett 1836 was part of “H” company & not “B” as we had assumed all these years. Arrrrh , that’s interesting they merged with “B” company during 1915 , then became 240292 later on. I have spent some time researching the history of my home town of Epping in Essex during WWI. In a local newspaper from 1915 I found a report saying that the 6th Notts & Derby spent a few days at Epping camp in early February. The report also says that they were accompanied by the New Mills Silver Band. I have recently come across two pictures of soldiers in Epping High Street on 9th Feb 1915. With the use of a magnifying glass I’m 99% sure that they are Notts & Derby. It looks as though they stayed in Epping until they moved on to Luton. If you let me have an email address, I’ll send the pictures to you. Fantastic site. Just wondered if you had any detailed information on my great uncle Corporal Harold Rycroft 266180 who served in D Coy 1/6th battallion. I have never been able to find a photo of him or seen his service records although i have visited his war grave in fouquieres which was very moving and immaculately maintained. Any information you have would be very much appreciated. I came across your site whilst researching a 1/5 man who was KIA on the 1/7/1916 and found a reference to him in an account of a survivor who reached the enemy trenches, which was great. I went to school in Ashbourne so I have found the information and photo’s within your site fascinating so just wanted to thank you for all your hard work. Hi Mike, Brilliant site, very useful for researching my Great Uncle Pt 1853 Charles Gordon Shaw 1/6th Battalion Notts & Derby Regt. When over in Flanders and the Somme last week on looking around the Sanctuary Wood CWGC Cemetery we found a headstone of Pt 1853 T Cook of the 1/7th Battalion Notts & Derby Regt. Would you know why two Privates in the same regiment would have the same service number? It is definitely true as we checked on the CWGC website and sure enough the numbers are the same. Mike just came across this site. What an amazing job you have done. You helped me find information about my Great Grandad some 10 years ago, for which I am eternally grateful. enlisted Buxton, Derbyshire and commemorated on the Arras Memorial. Given the date it was evidently during the German counter offensive of 1918 that he lost his life. I wondered if there were any pointers you could give me as you very clearly know the story of the regiment so well. Many thanks in advance. Hello and glad you like the site. George Percival was a ‘Derby Scheme’ recruit and posted to the 2/6th Battalion early February 1916. His original 4-digit service number was 4834. I’m pretty certain he would have gone to Ireland with the 2/6th for the Easter Rising before deploying with them to France in Feb 1917. Yes he died in the German spring offensive when the 2/6th were practically annihilated in a few hours fighting. Thank you so much. That’s really helpful. His two times great niece still has all his letters home. Hello Mike,I just wanted to say what an excellent site this is and I look forward to reading through it and following the articles in future.Im from chesterfield,an ex territorial (3WFR) and though my main interest is victorian military history i love anything to do with the sherwood foresters so this site is right up my street.On the various pictures page there is a photo of some unknown troops posing with rifles with bayonets fixed,the caption says they’re long lee Enfields but they’re actually lee metfords,you can tell by the profile of the magazine,the placement of the sling swivels,the stacking hook in front of the front sling swivel and the groove in the stock.An excellent picture by the way.Cheers. P.s. some sad news that I hope is wrong but the building that used to stand next to the jubilee drill hall on ashgate road is about to be “developed” which usually means knocked down though I’ve also heard it’s to be converted but either way I hope something of this building used by the Sherwood Foresters is saved. Hope you can help – I have two other men from the 2nd/6th on the Biggin War memorial who died on the 21st March 1918 along with George Percival. They are Sergeant William Webster (240729) who must have married after enlisting as he is listed as living in Spalding in the Soldiers who Died entry under his name. He enlisted in Ashbourne. Then there’s Private John William Buxton (92796) who married Hilda (?) and is listed as living in Grimethorpe, Yorkshire. I’ve not got very far with either of them in terms of their wider service although I have read the war diaries and can trace the events leading to their deaths. So far as the other Sherwood Foresters on the memorial are concerned I have Private Wilfred Buxton 240738, A Company, 1st/6th Battalion who was killed in action: 13 AUG. 1917. I have a very poor quality image of him taken from the Derbyshire Courier if you would like a copy I am very happy to email it to you along with the letter that his mother and step-father sent to the paper at the time he went missing. I also have an image of his half-brother James Henry Archer born abt 1891 who served with the 6th Battalion Sherwood Foresters and was injured – I think I’ve found him as Sergeant James Harry Archer. His 1915 regimental no 2787. Then when the numbers were changed in 1917 to six digits he is listed as 240732. I appreciate your help and admit to becoming more and more immersed in trying to find out more about the lives of these men.